Here at The Conservation Center, we strive to protect and preserve objects that hold intrinsic value to individuals and families, not just monetary value. During treatment, we often uncover forgotten details about a piece, and it can mean so much more to our clients when this information relates to their own family members and heritage. In this way, we approach each and every object with the highest level of care and attention. Recently, Naomi Steinberg, an Associate Professor of Religious Studies at DePaul University in Chicago, brought us a badly torn ketubah that was believed to belong to her paternal grandparent’s. Our conservators were able to meticulously piece this document back together, and through this process, Naomi also uncovered a slice of family history. Etymologically from the Hebrew word “to write,” a ketubah is a contract between the bride and groom, signed before the marriage ceremony to protect the rights of the wife. Originating Before the Common Era, and from the notion that marriage was contractual, ketubahs ensured that both parties exchanged certain “goods and services.” Quite progressive for the time, a ketubah focuses on insuring that the husband will continue to feed, clothe, and care for his wife, while providing a roof over her head—even in cases of divorce. The tradition of a ketubah ceremony is still widely practiced in modern times, so much so that Jewish newlyweds will often invest in calligraphy and framing in order to prominently display them in their homes. Some ketubahs are quite ornate and beautiful with elaborate illuminations, while many are more simple in design. What's important, however, in these documents are ceremonial and represent the commitment and obligations the couple has to each other. Ketubahs were seen to be so essential to daily life that they were written in the vernacular language, Aramaic, so that they could be read and understood by both the bride and groom. 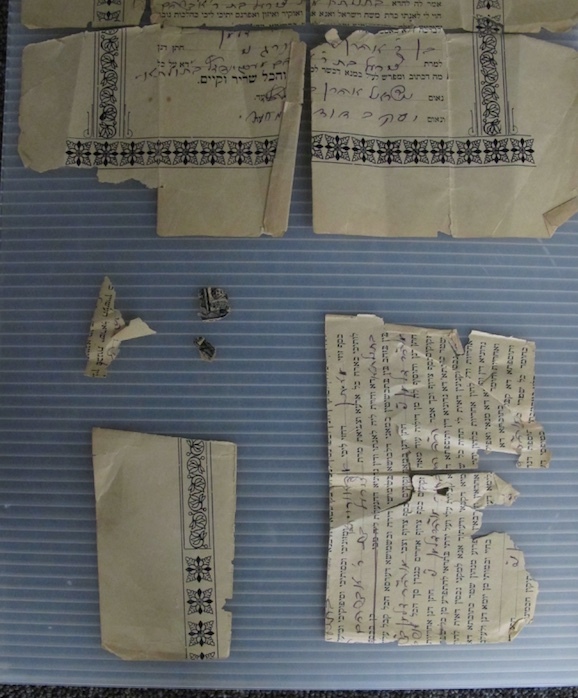 In order to gather more evidence that this indeed belonged to her grandmother, Naomi carefully collected as many shreds of the document as she could, and brought them to a colleague to decipher the Aramaic. Together, they were able to match the date on the document to a “February 28, 1920” inscription on Naomi’s grandmother’s wedding band. “That was definitely the ‘ah-ha’ moment; I was thrilled to match up the information from the ketubah to the ring,” said Naomi. In addition, upon further exploration, the pieces of paper provided clues to the traditional Jewish names of both her grandparents before they were Anglicized upon immigrating to America. “My grandmother went by Sylvia, but on this document she was identified as ‘Cyril.’ The groom’s name was ‘Solman,’ but he was known as Jacob, son of Aaron. The bride was Cyril, daughter of Abraham.” At this point, Naomi and her father uncovered new insight into their ancestry. This was all the proof she needed to bring the torn ketubah to The Conservation Center. At first glance, this ketubah was already in very poor condition, and significant pieces of the document were missing. Due to its improper storage over the decades, the paper was severely distorted with tears, creases, and losses scattered throughout. The piece was also acid stained, and needed a good surface cleaning. Due to the fragile nature and solubility of the media (the ink), we were not able to fully remove the stains. Our paper conservators were able to remove most of the distortion and creasing from the fragments by humidifying and flattening each separate piece to reduce surface deformations. The document was then treated with de-acidification spray to prevent future damage. Due to ethical conservation standards, we did not address the missing text in the pieces that were not retained, as it wouldn’t be true to the authenticity of the document. However, after puzzle-piecing the fragments back together and mounting them on a sympathetic-toned sheet, this ketubah from the 1920s is once again whole as a complete document. Together with The Center's client services team and with the aid of her dear friend, Naomi picked out a classic black frame for the family document. Instances like this are what make us love the work we do here at The Conservation Center. This is why we treat family heirlooms with the same dignity as fine art objects. By treating a piece of history with the respect it deserves, we can learn new things about our heritage and the ones we love in the process.